Update, 7/6/2016: Sao Noi passed away on Wednesday. Monks came to bless her body before she was buried in the forest she loved dearly. For Boon Thong, a rescued elephant, the worrying condition of her good friend, Sao Noi, left her desperately trying to comfort her companion the only way she knew how. Saoi Noi was rescued last month from a camp in Thailand that forced her to give rides to tourists for years. Upon meeting her for the first time, Sao Noi was described as a "very special, but very sad" elephant in a blog post by Boon Lott's Elephant Sanctuary (BLES), the organization responsible for granting her both freedom and a home. "She was emaciated and exhausted," the blog post reads. "We were told not to approach her as she was aggressive and we were also told repeatedly that she was not for sale." But in the end, BLES was able to take Sao Noi home. Even so, as an elderly, weak elephant in her 60s, the journey to BLES was hard on her - there were several times where she collapsed. But she survived in time to rejoin her friend, Sontaya, who had been rescued previously from the same camp. Since her arrival at BLES, Sao Noi quickly became close to a herd of elephants - one of them by the name of Boon Thong. Boon Thong is a former trekking elephant, blind in one eye, with a deformed back and scars all over her body from the years of hardship she endured. At BLES, the two often spent time together with their herd, grazing in the forest and playfully racing each other back to the sanctuary. But recently, Sao Noi's health took a turn for the worse. "She has collapsed twice more since her arrival," BLES wrote on Facebook. "We are doing absolutely everything we can to ensure she is as comfortable as possible, and we have been up with her every night, making sure she is eating and defecating normally." During her most recent episode, which occurred on Monday, the elephant was placed on IV fluids and, as she remained collapsed on the ground being watched over by her human caretakers, she received an elephant visitor as well. 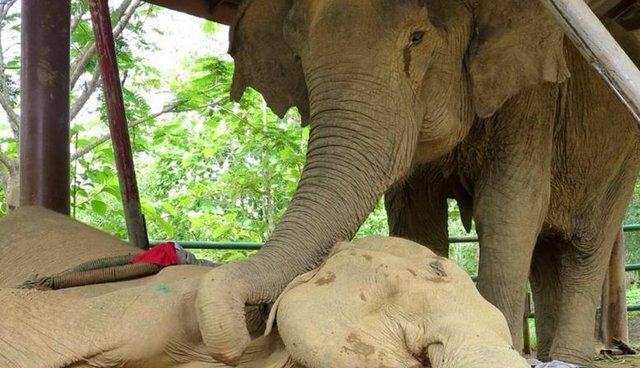 "Boon Thong has been particularly concerned for Sao Noi and has repeatedly stood over her, nudging her gently with her trunk, trying to get her old friend to stand again," BLES wrote on Facebook. Though the rescue was deeply worried that Sao Noi wouldn't recover from her condition, it seemed that a combination of the team's diligence and the unwavering support of Boon Thong was more than enough to inspire Sao Noi to not give up just yet. "When Sao Noi collapsed again this morning, we all felt it was best to let her rest," the post reads. "After four hours of prayers and peace, Sao Noi started to lift her legs and move! We all jumped into action, set up the hoist and followed her lead. With lots of encouragement and support, Sao Noi rose to her feet." According to BLES, Sao Noi is fragile and weak - but for now, she's standing on all fours. The hope is that she'll soon be able to join Boon Thong and her other dear friends out in the lush forests to enjoy her newfound freedom. Want to help BLES continue doing good work for elephants in need? Consider making a donation or "adopting" an elephant here.